If you use your iPhone a lot for taking photos but find yourself wishing for more versatility, you may find what you’re looking for with the Ultimate iPhone Lens Kit from Bazaared. The kit includes an 8X telephoto lens, fisheye lens, wide and macro lens, a 2X telephoto lens, and a 60X magnifying microscope. The lenses have aluminum bodies and glass optics. The small lenses attach to the iPhone with magnets, but attaching the telephoto and microscope lenses requires the use of the included back cover. All these lenses plus a little tripod store in a compact case. It’s available for the iPhone 5/5S or the iPhone 5C for $199. 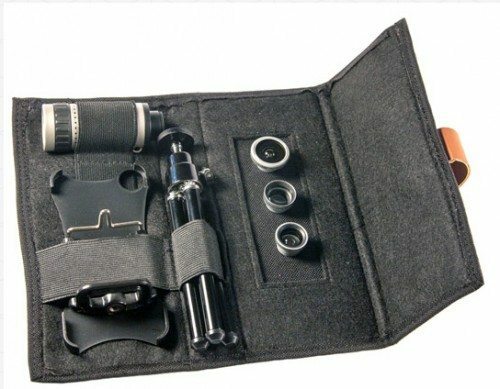 Here’s the ultimate iPhone camera lens kit originally appeared on The Gadgeteer on November 26, 2013 at 12:00 pm.